← Do you want pastrami with that? Finding the right place to stay when you come to New York for the first time is a big challenge. There are many options available in both the style and location of accommodation and while the success of your choice may not make or break your holiday, it will make a big difference to your overall experience. I have recommended a couple of hotels in the past year, but increasingly I am being asked about private apartments and which are the best areas to stay. I have written and rewritten this article trying not to be bossy about what I consider to be the best locations in the city. Wherever you stay, you will have an interesting experience of NYC and does it really matter if it’s not perfect? Well, the thing is I do feel a sense of responsibility, and want everyone who takes the time to listen to the ABC or read my stories here, to be rewarded and go home happy. So throwing budgets, prejudices and adventure into the mix, here are some suggestions…. NYC is changing constantly and there are great reasons to visit lots of different neighbourhoods. For example, I love to explore the East Village for eateries, Tompkins Square Park and vibe – but I wouldn’t really want to stay there. I enjoy the bike ride up the Hudson River on the west side, but much of the west side is miles from the subway and those Trump towers from 59th to 72nd are isolated and forbidding. So choosing an area comes down to what you want to do here, how fit you are and what your priorities are. The subway map will give you a perspective of neighbourhoods and an insight into how easy it will be for you to get around by public transport. 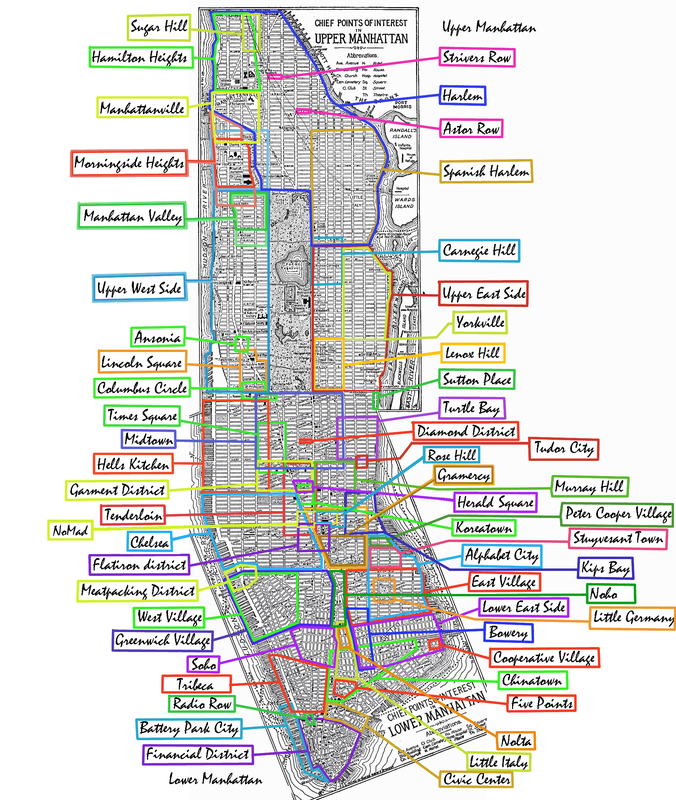 For example if you stay within walking distance of the green 6 line on the east side you will be one subway ride away from most of the city’s museums, Grand Central, Union Square, Noho, Soho, Little Italy, China Town, East Village and Town Hall / Brooklyn Bridge. Alternatively if you stay at Washington Heights on the Upper West Side you will have to change lines twice to get to the Museum Mile and you will certainly not be able to walk there with comfort. For distance, when you look at a map of Manhattan, count about one minute per street ( if you are briskly stepping it out ) and about 5 minutes per avenue. Use this formula to know how long it will take you to get from the subway to an apartment. You can see that if you were considering staying on 11th avenue and West 29th street, you would have about a 20 minute walk to get to the subway. This may not be a problem unless you have been walking all day and are exhausted, and you decide to look for a cab around 3pm. Mid to late afternoon is changeover time for cabs and it can be a real test of skill, luck, or simple bloodymindedness to find one and grab it before someone else does. 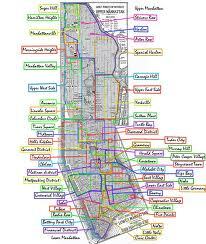 Boroughs. I would always recommend that you stay in Manhattan first and only in Brooklyn if you are near the bridge. When you have put so much energy into getting here, you may as well be in the thick of it. When you step out of your front door that first morning you want to be able to say ‘Hello New York!’ without having to yell too loudly. Also, Manhattan is a walking town, so if you stay on the grid, you are giving yourself the advantage of time with the opportunity to make discoveries as you wander along. The villages – East, Greenwich and West, are full of interesting restaurants and have a great atmosphere. Washington Park is close by, you have the Hudson and East rivers on either side, and tons of history. But apartments in this area will tend to be walk-ups ( no lift ) and no doorman. So if you don’t like stairs and want the security of a 24 hour doorman look to east midtown, upper east side, around Columbus Circle, the theatre district and the upper west side. Gramercy / Flatiron is a great area, parts of Chelsea are OK, and Tribeca, Soho and the Financial District are trendy and transitional. Google satellite maps can give you lots of help with locations by providing a street view which can provide an insight into the character of the neighbourhood. Again looking at the 11th and 29th location, you can see in the photo attached that the area is industrial. This google view may be slightly out of date, but it nevertheless gives you a feel for the area. New Apartment blocks are set between nightclubs ( Scores is a block away ) and car parks. If you are looking to be surrounded by brownstones, or jazz clubs or restaurants, then keep looking. About security with Airbnb, I have friends who have used this service with great success. What makes it a little tentative is that you are dealing with individual owners of apartments rather than a hotel where there is always someone on the front desk to answer your call or inquiry. But the internet is full of information so you should be able to check the people and place out first. If people don’t respond to your email, try the next place. If they are so bad at communicating imagine arriving at the front door after a 24 hour flight and finding there’s no-one waiting to meet you…! *** A regular Australian visitor to NYC kindly wrote to me and recommended Flipkey as being a very reliable source of good apartments. Thanks Heather! I am about to head back to NYC next week for my third trip in 18 months…I am in love with that city! I stay for a longer period of time and enjoy staying in apartments to get the feel of the city. Hotel living after a week or so also gets quite tiresome. What you say in your article is so true. For each visit, I have used Flipkey to find accommodation, which your readers may also like to investigate. The trick is to find Flipkey owners and managers who are professional and helpful from the beginning. I am happy to make some recommendations if readers are interested. Thanks always for the great entries in your blog. They help feed my NYC addiction between trips. Thank you for your feedback Heather, and for offering your experience with Flipkey. I will pass this on. Sounds like you have had some good accommodation experiences – not to mention NYC! Great to hear you are on your way back – you will be pleased to know the weather has gone from snow to sunshine and this whole weekend has been glorious. The city awaits you! Hi Heather Thanks for the tip. A friend and I are first timers to NYC, arriving 1st May. We would love some recommendations. We were looking around the Gramercy area but are open to suggestions. Gabrielle, So happy to hear about the weather! Hopefully we won’t have to pack the thick jacket after all! I would love some recommendations for budget accommodation for a trip in early 2015. Many thanks for any suggestions…. Wow, you are really planning ahead Deb – good for you. I have been getting great reports about FlipKey and AirBnB – in fact a friend of mine is coming to NYC in September and will be renting an apartment in the East Village via FlipKey. She will be writing up the experience so wait to hear how she finds it – it may turn out that the location and apartment is a perfect fit for you…. Thanks for this very helpful and totally unsettling article Gabrielle! What are we doing here?! You see I have ulterior motives Marcia! We used Airbnb to find our apartment in NYC and have also used it for New Orleans. Communication with the owners and the company has been seamless and easy. The apartment in NYC was in the West Village and we found it an ideal base for everything we wanted to do. As you mentioned in your blog it was a four storey walk up – no lift. The apartment was great. Very quiet and warm … perhaps a little too warm at times. The subway was convenient and there was an amazing choice of cafes and restaurants within walking distance. We loved it and would definitely use Airbnb again. I enjoyed listening to your segment with Rod Quinn in the lead up to our trip. Hello Fi. Thank you very much for sharing your feedback and your time in writing. It’s great to hear your experience was positive and that you could appreciate the West Village in that personal way that Airbnb allows. Sounds like you had an amazing time. We’re lucky to have more choices with accommodation now – and it’s especially good to hear when it works. So thanks! Hi Gabrielle! Love your reports with Rod. My husband and I would like to bring our family (10 of us altogether with son and daughter and their families) to New York for 5 days over Christmas 2014, and I’ve been searching on airbnb and tripadvisor to find an apartment which would accommodate us in Manhattan. Its sooooo difficult to sort the wheat from the chaff! I don’t suppose you would know anything suitable offhand? would appreciate any advice….. thanks Shelley. Dear Gabrielle thank you so much for your personal answer to my query – I’m always blown away when people as busy as you take the time to answer an email! Just looked at The Ferry, you’ll be sad to know they are having to move (and you’d better get down to the 12th St pier with your tooter! ): Monday, July 1, 2013 5:00pm in EDT 12th Street Pier, Hoboken After a nine year sojourn calling Hoboken home, we just found out we must leave here immediately. At 5pm on Monday (tomorrow), the historic Yankee Ferry will set sail (ok, get tugged) to the shores of New York City. It will be a long voyage, all the way to Red Hook. We’d love for you to join us for one last good~bye, on the 12th Street Pier as we float off into the sunset. We have two small requests: bring any musical instruments to play us off by and some “floating tears” (bubbles) so we may have the grandest of bon voyages. Please share this with your Facebook Friends, family, co~workers, and especially, the Hoboken community. Thank you Shelley – your comments have really made my day! Will see if I can get over the river tomorrow for the Ferry’s swan song… They always do everything in style. Hello Gabrielle… I am an insomniac so get to hear you on Rod’s program. Get mad when I miss !!! We are two 70 plus friends who have booked to visit NY for 12 days starting May 1st 2014. I have been to NY twice. Once 50 years ago and last time 2 weeks after 9/11 Jo my friend has never been . We would love any help with accomodation. Definately need two beds !!! Thanks for listening Doris and great to hear that you are coming back to NYC. Wow, what a contrast you will find in your third visit! You have lots of time to plan and it sounds like you are already very organised. With accommodation, it depends on your budget and patience with searching alternatives like AirBNB on the internet. I hear mixed reports about AirBNB, but you can be lucky, especially if you book early. If you want modest and clean, I think the Seafarers House will work very well. The Affinia Shelburne has large rooms ( some with kitchen ), an excellent location and they have a weekly rate. Then if you want luxury the AKA is excellent and they are very Australian-focused. ( Actually if you want luxury, the sky is the limit, you can take your pick! ). If I hear of other new places coming up I will let you know. Please remember to put the Conservatory Gardens on your list – all the tulips will be out when you are here and that is an absolutely magnificent sight. Also Barge Music under the Brooklyn Bridge and concerts at The Frick – along with anything else I find between now and then… Happy planning and safe travels! Hi Gabrielle, I really enjoyed listening to you this am on the ABC, suffering insomnia so great to have something interesting on the radio. My partner and I luvevin Tasmania and we are heading to NYC, our favourite destination, in May. It’ll be our third trip to NYC. Each time in the US we head down to West Virginia after our NY visit to stay with a lady and her family who I “met” 35 years ago as a pen pal when we were both young and starting our families. We are now both grand mothers, and have met a half a dozen times over the years and have become “international sisters ” and best friends. My partner and I are cosidering air BnB for accommodation this trip, so I was really interested to read your comments. Thanks for such an interesting blog, and I’m dying to try both the chocolates and the donuts. G’day! What a great story Carole! I admire you for being such a good and constant correspondent & I can see the reward is in now being able to actually visit each other. Good for you. Also good luck with AirBNB ( or Flipkey ) – hope you find a great spot. It is definitely the way to go, staying in an apartment and discovering a new side of NYC. You never know what fantastic discoveries ( or chocolate shops ) you will find! What a great story Carole – and what an excellent correspondent you have been all these years – I can see the reward in now being able to actually visit each other. Good for you! October,I think as we are in our early 70’s we will stay in a hotel with lifts etc. If you have an idea where we should look that would be great but the main reason I’m writing is for you to tell us what we should be seeing. I just love your enthusiasm and the way you and Rod interact. We have decided on the Shellburn Affinia as you saggested for 11 nights and then we come back again for 3 nights,could you suggest a bit of luxury /nostalgia. We are wondering if we will do some tours outside of NY. Finally coming to visit this fascinating city you call home (my previous comment refers) and looking at an airbnb apartment in Soho. Thank you again for this fabulous post, I read it all the time. I’m excited and so looking forward to this wonderful experience with my daughter. It’s my 60th and her 30th birthday celebration together! We’re coming over in November..
How fabulous Deb and good for you! What an excellent way to celebrate. Soho has loads of interesting places in walking distance and the Fall is a beautiful time to visit. I guess you’ll be looking for some places to have cocktails….?! No doub t Gabrielle? Do you think Soho would be a good neighbourhood for a short stay? Yes, Soho is a good neighbourhood to stay, although I would personally rather be on the east side of it than the west side. ( The west side around the entrance to the Holland Tunnel is a bit bleak. ) The east side venturing into Nolita has lots of street life and character. Look at the proximity of places to the subway and at ‘walk-up’ status so you don’t get stuck with a hundred stairs to climb. Also google-maps can give you a good view / impression of the street. The great thing is that you have lots of time to look and plan….